Welcome back to Super Sunday, Snack n Pack!! Today we’re sharing a fast and easy recipe that will get you out of the kitchen super fast and in front of the flat screen, ready to watch the game in under 30 minutes. 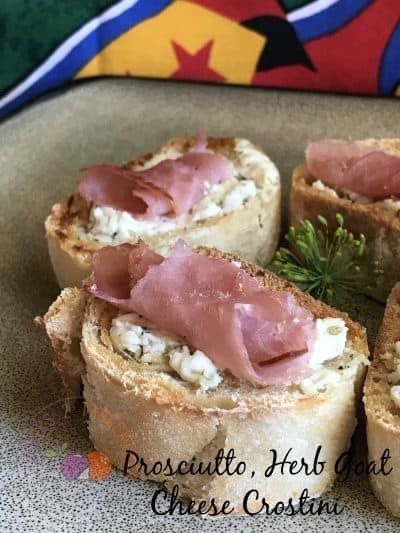 Prosciutto and Herb Goat Cheese Crostini is a simple yet classic ‘recipe’ that has been making an appearance on hors d’oeuvre buffet tables for eons. The reason for that is also a simple one…crostini any crostini are delicious! Two of my favorite ingredient combinations has to be goat cheese and honey. A little drizzling of honey over goat cheese, to me anyway, makes it taste that much better. It adds just that right amount of sweetness and takes it from yum to wow! This recipe is actually one of my favorites also. The combination of smokiness and saltiness from the prosciutto, along with the sweet honey and tangy flavor of the goat cheese is fabulous..
Crostini [kroh-STEE-nee] means “little toasts” in Italian. Crostini are small, thin slices of toasted bread, which are usually brushed with olive oil. The word also describes canapés consisting of small slices of toast with a savory topping such as cheese, shrimp, pâté or anchovies. Sometimes crostini refers to the equivalent of a crouton used for soup or salad, example: French Onion Soup or Caesar Salad. Prosciutto [proh-SHOO-toh] is Italian for “ham” Prosciutto is a term broadly used to describe a ham that has been seasoned, salt-cured but not smoked and air-dried. The meat is pressed, which produces a firm, dense texture. Italy’s Parma Ham is the true prosciutto, although others are now made in the United States. Prosciutto is usually eaten as an appetizer or first course when served with melon or figs, which is delicious. The goat cheese used in this recipe is Montchevre Goat Cheese . We love this cheese! 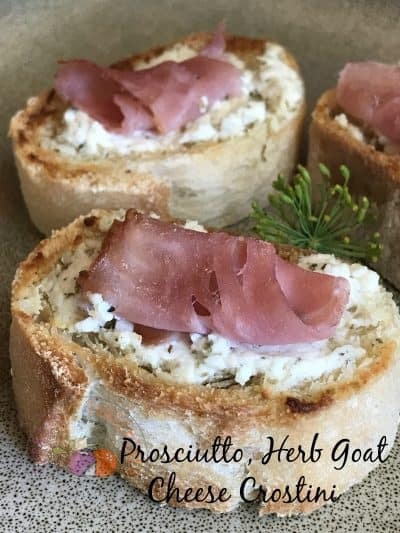 It comes in several different varieties from blueberry vanilla, fig and olive to the herb goat cheese used in this recipe, we love them all. If you happen to come across a package in the specialty cheese section of your grocery store, pick up a package and give it a try. I’m pretty sure you’re gonna love it too. Here is another favorite recipe of ours Pear Bacon Honey Goat Cheese Crostini. Delicious salty and tangy crostini. The perfect game time or anytime snack. Slice baguette, on the diagonal, into 12 1-inch thick slices. Place slices on a baking sheet and lightly brush tops with olive oil. Broil just until lightly toasted, watching closely. 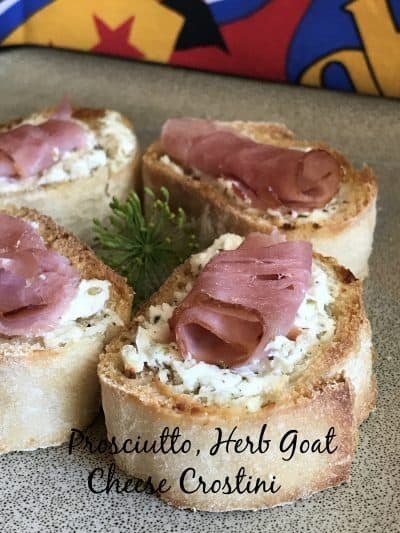 Remove from oven, spread crostini with herb goat cheese. Place one 1/2 slice on top of each crostini. Place under broil for another few seconds, watching closely, until cheese is melted and prosciutto is crisped. Remove from oven, place on a serving platter and drizzle with honey. Serve.